This municipal bond fund has $2.39 billion of assets. It has total expense fee of 1.86% per year. The fund sponsor is Nuveen Fund Advisors. Scott Romans is the portfolio manager since 2003. It also has a high tax free yield of 6.33%. In 2015, it has year-to-date return of 2.59%. For the past 1 year, the total return is 17.45%. This fixed income fund has returned 7.03% over the past 3 year, and 10.86% over the past 5 year. Morningstar has ranked it with 4 star rating. This Nuveen fund has 397 holdings. The current average coupon is 4.82%. The portfolio turnover rate is 25%. Top 5 sectors are Tax Obligation/Limited, Health Care, Tax Obligation/General, Water and Sewer, and US Guaranteed. 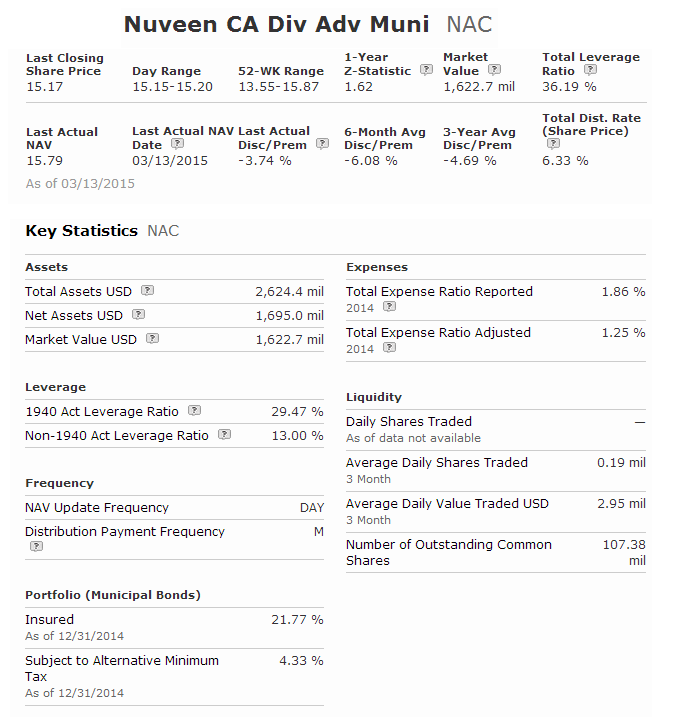 This Nuveen California Dividend Advantage Municipal Fund has a high yield. Expense fee is higher than typical bond ETF.